. 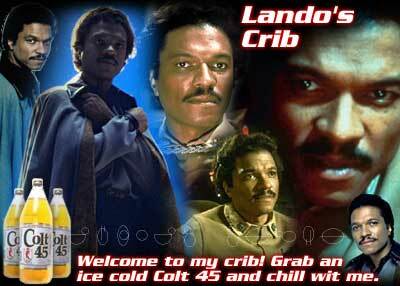 :: Welcome to Lando's Crib! ::.
.:: Are You As Smooth As Lando? Like: ::. Who else wants to be a "smoooooth" soul brotha? Send me an email for details!
. :: What Be The Hap's In Cloud City? ::. Lando's Crib Got Cleaned Up! Today I have launched a new version of Lando's Crib along with the redesign of The Order of the Sith Online! Stay tuned for more from Lando's Crib in the near future! Billy Dee Williams to appear at StarCon in Denver, CO! Today we welcomed Smooth J.D. into our ranks. Welcome to Lando's Crib! Today we welcomed Smooth Paul into our ranks. Welcome to Lando's Crib! Lando's Crib Goes Live On The Internet! Today is a day that will be long remembered. Lando's Crib was launched! Enjoy the smoothness!
. :: The Brotherhood Alliance ::. Smooth Rob - Youth Pastor and Graphic Designer @ Large! Smooth Paul - Funky white boy @ large! Smooth J.D. - Jack Tripper @ large! Smooth Bryan - School teacher and honorary hispanic @ large! Smooth Eli - College student and musician @ large!
. :: Billy Dee's Smooth Quotes ::.
.:: Let Me Know What's Up! ::.
.:: Colt 45 Disclaimer ::.